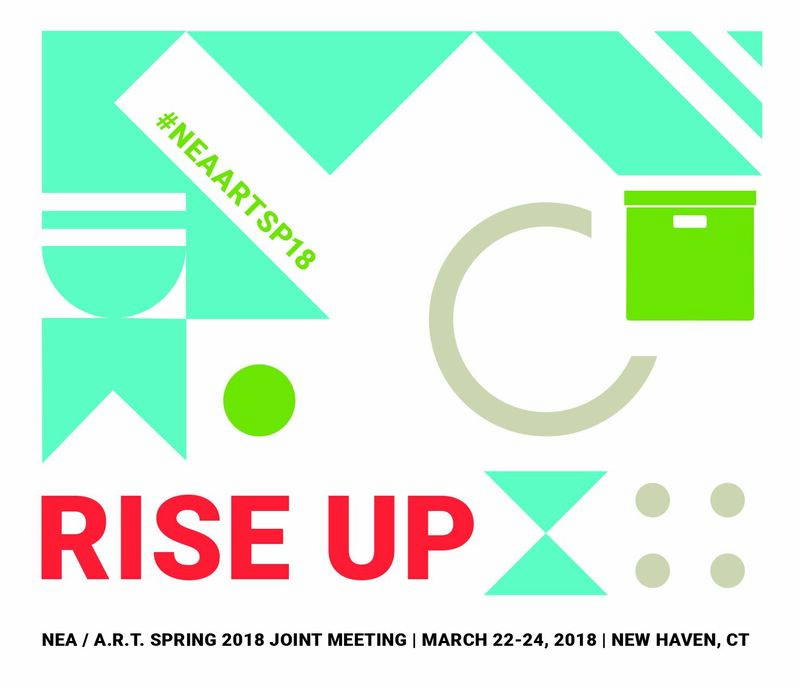 Join the New England Archivists (NEA) and the Archivists Round Table of Metropolitan New York (A.R.T.) for a joint Spring 2018 Meeting. At “Rise Up,” we will explore the personal, professional, and political implications of archival advocacy, particularly with regard to social justice efforts, community engagement, economic challenges, activist tactics, and career sustainability for individuals in the archival field. In addition to our sessions, the schedule will include repository tours, a community work day, and the chance to meet up with colleagues from across New England and metropolitan New York. guidebook or download the Spring 2018 program. This event offers a chance to learn more about the work of the XFR Collective, a New York- based nonprofit organization that partners with artists, activists, individuals, and groups to lower the barriers to preserving at-risk audiovisual media. XFR members will discuss the work of the collective and screen some of the material they have digitized. Time will be available at the end for a Q&A. Please note: no entry after 6 p.m.
Get to know colleagues while enjoying delicious food. We are offering the opportunity for small groups of conference participants to get to know one another while visiting some of the best restaurants in the area. Reservations for up to 6 people will be made at 7 restaurants, or participants can stop by Café Nine for a slice of pizza sponsored by the Records Management Roundtable. Each dining group will have spots specially for new members who are interested in getting to know seasoned professionals, and to ensure a mix of membership levels. Participants will meet in the Omni Hotel lobby, head to the restaurant as a group, and pay for their own meals. A place for weary conference attendees to retreat and recharge, the Respite Room is a talk- free zone featuring tasty snacks and coloring books. Sponsored by the Inclusion and Diversity Committee. Meet in the Omni Hotel lobby. All paces welcome. Join us for the 4th Annual Archives Meeting Run! Review résumés or have your résumé reviewed by an experienced colleague. Sign up at bit.ly/2EQRUpW. All attendees are welcome to join NEA President Ellen Doon and the NEA Executive Board for lunch, the annual NEA business meeting, and the NEA awards ceremony. Matthew Connelly is professor of history at Columbia University. Connelly holds a bachelor’s degree from Columbia and a PhD in history from Yale. His publications include A Diplomatic Revolution: Algeria’s Fight for Independence and the Origins of the Post-Cold War Era (2002) and Fatal Misconception: e Struggle to Control World Population (2008). Connelly’s current research focuses on confronting the national security state in the age of “big data.” In 2013, he created the “Declassification Engine,” a MacArthur grant-funded project, which uses metadata, computational methods, and digital tools to uncover redacted material in declassified documents and facilitate access for researchers. Connelly also teaches an interdisciplinary course, Hacking the Archive, and serves as principal investigator for History Lab (history-lab.org). Emily Drabinski is Coordinator of Library Instruction at Long Island University, Brooklyn, where she also serves as secretary of the faculty union, the Long Island University Faculty Federation. She sits on the board of Radical Teacher, a journal of socialist, feminist, and anti-racist teaching practice, and edits Gender & Sexuality in Information Studies, a book series from Library Juice Press/Litwin Books. Drabinski’s research and writing interests include critical perspectives on knowledge organization and access and the role of information workers as organizers for social change. Drabinski holds a BA in political science from Columbia University, an MSLIS from Syracuse University, and an MA in composition and rhetoric from Long Island University, Brooklyn. In recent years, churches and universities have begun to reckon with their deep- rooted connections to slavery. Material evidence of these institutions’ engage- ment with slavery lies hidden in plain sight in archives and special collections, providing both subject and means for historical truth-telling. In the Episcopal Church, archivists are leading efforts to identify strategies of reconciliation in recognizing the legacies of slavery and segregation and advocating for church- wide spiritual and political justice. Once examined primarily for their ability to tell histories of “great men doing great things,” church records are now being reevaluated and mined for their usefulness as primary sources of social and political history. Similarly, over the past decade, universities including Brown and Harvard have been exploring their ties to slavery. Archivists have played critical roles in these efforts by curating exhibitions and websites that reveal stories of real people whose lives until recently have been ignored and unrecognized. Join the Community Archives Advocates Roundtable for a panel presentation that will introduce NEA to local community archives in the Connecticut area. Attendees will gain a better understanding of community archives and learn about the similarities and differences, missions and goals, and day-to-day operations of three of them. is is an opportunity to listen to community archivists, embrace and appreciate their work, and possibly and avenues for collaborative projects or supportive partnerships. Including presentations from three active community archives, this panel will mark the beginning of this NEA Roundtable’s efforts to bring knowledge of community archives into the spotlight. Web archiving brings new narratives and sociotechnical challenges into archival spaces. e breadth, depth, and ephemerality of collective and individual experiences of the web demands collaborative archival approaches. How can archivists, creators, and subjects of web-based material together establish context-sensitive, ethical approaches to web archiving? is session focuses on working together to capture the live web efficiently, comprehensively, and sensitively. With sustainability, collection building, and division of labor as central themes, we’ll discuss experiences with outreach, collection policy development, and maintenance. We’ll also consider strategies to advocate for the documentation of the web within and beyond institutional infrastructures. We hope to leave participants with both answers and questions as they embark upon their own collaborations. Recently acquired by Providence Public Library (PPL), the records of two Providence-based arts organizations engaged in social practice — AS220 and UPP Arts — have many things in common. They represent organizations that have evolved organically in response to community needs. They also reflect the output of artists, performers, and musicians who have moved outside the commercial or gallery worlds to engage with issues related to race, gender, sexuality, socioeconomic disparities, urban development, and the environment. Each collection includes a wide variety of record formats and exemplifies contemporary local history created by individuals often ignored in archives. In response, PPL shifted its traditional processing approach to integrate the values of social practice into the archival method. Archivists worked collaboratively with donors to develop processing plans, identify potential users of the materials, and think creatively about description and access for those users. Discussion with both archivists and donors will highlight the opportunities and challenges that have arisen. Planning a renovation or building project for archives requires advocating not only for the space needed for processing, shelving, and researcher interaction with collections, but also for the appropriate preservation environment and security measures. Our work requires square footage and infrastructure that many outside our profession do not immediately understand; archivists must communicate effectively with administrators and architects to achieve a functional space that is designed well for the work we do. In this session, architects will explain the phases of design and construction and discuss what they have learned from archivists and librarians about their work and needs, and archivists with experience in renovation projects of varying scale will discuss how they advocated within their institutions and with architects for space and improvements. Presentations will be followed by time for discussion and questions. Want to get things done? Organizing principles and practices are valuable skills for any archivist to master. Whether you need to advocate for a new copy machine, make the case for a digital preservation program, or address wages or working conditions within your institution, you can’t do it alone: you need a crew of impassioned people working together to get the goods. is session will teach two fundamental organizing skills: how to talk to people when you want them to join your team, and how to make and assess lists so you know whom you need to talk to and how. Participants will learn — and practice! — necessary organizing skills and will leave the session ready to get started at their home institutions. The documentary and cultural heritage of our nation is at risk from man-made and natural disasters. Disasters disrupt people’s lives, impact continuity of governmental functions, and jeopardize the existence of our nation’s cultural collections — but, as cultural heritage organizations recover, so does the community. is session will present the experiences of both instructors and participants in a five-part workshop series on disaster preparedness and emergency response for cultural heritage organizations and firefighting communities. Developed thanks to a two-year grant from the National Endowment for the Humanities, the work- shops were created jointly by the Massachusetts Board of Library Commissioners, COSTEP MA, and the Massachusetts Department of Fire Services/Massachusetts Firefighting Academy. In addition to training people to prepare for and respond to disasters, the workshops have enabled a close relationship to develop between the cultural heritage and firefighting communities. Information professionals are often tasked with advocating for and implementing digital preservation practices within our institutions. is session will explore various approaches to digital preservation and the questions we face, including: How do we advocate effectively? What does collaboration look like, and how are digital preservation issues presented to “non-experts”? How do environmental, financial, and social ethics concerns affect our approaches to digital preservation? What can we learn from colleagues outside of the archives profession? How do institutions balance unique priorities, resources, and digital preservation needs? Incorporating examples from diverse institutional contexts and record types, the speakers will discuss case studies and resources to inform future collaboration and sustainable digital preservation efforts that will provide wider, more equal access to our collections. Museums and museum staff tend to be object-centered in their concerns and cataloging, and so archives situated within museums face unique challenges and opportunities. Internal outreach that educates museum staff about archival best practices is key, from one-on-one meetings about records management to developing a controlled vocabulary to discuss manuscripts with non-archivists. Internal outreach goes hand in hand with promoting the archives to external audiences as well; as we clarify the role and importance of archives to museum staff and to ourselves, we find common ground, synergy with the object collections, and new partners for archival advocacy. is session will explore specific cases of internal and external outreach: what kinds of challenges they present, scalable strategies, and how internal and external outreach influence each other. As oral histories preserve a group’s experiences, they can also be a source of strength and power. Join us to hear about four distinct oral history projects and experiences: a project at the Weeksville Heritage Center documenting the history and heritage of the Weeksville community of Brooklyn, New York; projects at the New York Philharmonic Archives to capture the recollections of orchestra musicians and audience members for its 175th Anniversary and for the Centennial of Leonard Bernstein; work at the Center for the History of Medicine to document the experiences of students, trainees, and faculty of underdocumented communities at Harvard Medical School; and a report of the 2018 NEA/A.R.T. Day of Service oral history project at the New Haven Pride Center. How is power perpetuated in the archival record, and how can archivists empower underrepresented voices in the archives? e session discusses archival initiatives designed to empower Black and Indigenous communities by finding underrepresented voices and gaps in existing archives, creating new archives, and reclaiming physical and intellectual control of their own archives. Case studies will include the Black Sound and the Archive Working Group at Yale University, the History Keepers Program at Yale, the Protocols for Native American Archival Materials, and the Indigenous decolonization initiative at the San Diego Museum of Man. Viewing archives through the lens of power, agency, and representation forces us to radically reimagine research processes, professional training and recruitment, access protocols, appraisal methods, and what it means to be an archivist. CRIS, Connecticut’s radio-reading service, the Connecticut State Library (CSL), and IDEAL Group, a technology company dedicated to enhancing independence for individuals with disabilities, collaborated on a project to provide access to archival documents and publications for individuals unable to read print mate- rials, using human-narrated recordings and e-books. e documents came from CSL’s rich collection of World War I materials; the voice talent and recording production from CRIS; and the tools to create searchable e-books from IDEAL Group. Panel members will moderate a conversation on the process, challenges, and benefits of collaborating among diverse organizations. ey will also discuss the challenges of working with and creating transcripts from various document formats, including government records and publications, diaries, newspapers, and questionnaires compiled from returning World War I military personnel. Participants will be able to explore the recordings and witness a demonstration by panel members of the free open-source e-book and knowledge mining tools developed for this project. For many individuals working in archives and special collections, challenging work environments arise when social and political climates quell diversity, discourage inclusive behaviors, and devalue archives and the labor that sustains them. is session explores how archivists can advocate for them- selves, prioritizing self-care while juggling professional and institutional demands. Speakers will present firsthand accounts of confronting oppressive systems, coping with micro- and macro-aggressions on the job, and dealing with cultural devaluation of their labor. en discussion will open to all participants, focusing especially on identifying practical tactics for dealing with workplace stresses and models for behavior that can help de-escalate or eliminate problematic interactions. is session will recommend ways those working in the archives eld can respectfully and ethically support each other while protecting their own mental, physical, and professional well-being. Recent archival discourse reflects an increasing attention to complex issues concerning equity, access, and advocacy: equity not only in terms of diverse collections that reflect the experiences of marginalized communities, but also of progressive approaches toward developing inclusive repositories; access in terms of the research skills, discovery tools, and institutional openness required to utilize collections for educational, civic, and personal enrichment; advocacy in terms of robust support for collection development and usage, both internally and externally. is session will present stories of experimentation and transformation in public libraries in the northeast and across the nation, particularly focusing on the evolving roles of community-centered archivists whose decisions have social, educational, and political implications. e enduring civic importance of public libraries — where issues of openness, neutrality, and ethics continuously inform archival practice — confirms that archival work cannot be static or insular and must instead strive to be dynamic, transparent, and participatory. Archives and records management activities are intertwined within the records life cycle model and are often implemented in tandem to ensure the successful management of information. is being the case, it is very important for archivists and records managers to work together in order to promote each other’s activities. When records managers stress the importance of archives in maintaining permanent records, it helps to provide a compelling argument for the funding of archival activities. Likewise, if archivists stress the need for a fully developed records management program in order to ensure that all permanent records are properly maintained, it helps to bolster support for records programs. is session will focus on how archivists and records managers can work together to advocate for one another as well as promote a more complete information management program within their organization. This interactive session brings together archivists who have worked closely with artists as both content creators and researchers and will offer attendees a space to brainstorm and share their experiences. Angela DiVeglia and Jeremy Ferris will discuss their process of creating and publishing the comic book “Lizard Ramone in Hot Pursuit: A Guide to Archives for Artists and Makers.” Colleen Quigley will dance her presentation, which addresses the myriad of practical and philosophical issues relating to the archiving of the performing arts from the archivist/ dancer perspective. Finally, the presenters will facilitate a conversation about the challenges and rewards of working with artists, with a focus on creative research, outreach tools, access points, documenting performance, and research-based art. Archivists’ jobs, practices, and institutions are impacted by government budgets, policy decisions, and political maneuvering. With a rmer understanding of legislative processes, we can all become advocates for our profession. Seasoned political organizer Michele Evermore will discuss how budget-making happens on a national and local level and will cover some basic tools of advocacy, such as meeting with your legislators, phone banking, and letter writing. Responding to Michelle Caswell and Marika Cifor’s foundational text, “From Human Rights to Feminist Ethics: Radical Empathy in Archives,” this roundtable will provide a forum for discussing the ways in which our profession can “center radical empathy and obligations of care.” Following brief presentations from speakers, small-group conversations will bring together speakers and attendees to focus on applying radical empathy as a theory and practice within their work. When faced with a personal challenge in the workplace, we often feel alone. We find ourselves in situations that make speaking up for what we need difficult. But we are not alone. Many of our colleagues face the same self-advocacy conundrums. In this session, four panelists will share their own efforts to advocate for themselves. From organizing forums to combating oppressive power structures in LIS institutions and pedagogy, to advocating for oneself and one’s archive in underfunded institutions, speakers will present strategies and lessons learned from their self-advocacy. ere will also be time to engage in small participatory discussion groups to strategize our way forward. We can combat isolation by working together. To properly document, serve, and reflect our communities, inclusion and diversity in the archives are imperative. is session will address these issues as they relate to our collections, services, and workforce. How can we design systems that account for diverse cultural materials and ways of knowing? How can we ensure that underrepresented voices and perspectives are represented in our collections, exhibits, events, and outreach efforts? How do we build bridges between large organizations and communities to help capture their stories? How do we increase diversity within the archives community and create a work environment where all members can thrive? e session will incorporate perspectives from an interdisciplinary information systems design project, an LGBTQ+ community archives, an international audiovisual preservation organization, and institutional programs to increase mentorship and diversity. Challenging collections offer our institutions an opportunity to relate to current events and enrich our audience’s understanding of and connections to the past. rough the use of artifacts and facsimiles from their collections, presenters will describe recent efforts at the Wadsworth Atheneum to use difficult collection material to foster constructive dialogue on equity, bias, and inclusion; highlight intersectionality, advocacy, and LGBTQIA collections at True Colors, Inc.; and discuss various programs the Litchfield Historical Society has undertaken to create conversations around sensitive collections, as well as challenges with cataloging and digitizing such collections. Presenters will describe the changing ways in which these relics have been used, interpreted, described, and displayed in their institutions. They will also explore how these collections can help us understand and contextualize current events. Participants will be invited to offer their own perspectives on using challenging documents and artifacts. Changes in descriptive and encoding standards and tools have created new opportunities for archivists to describe collections and creators. One presenter, focusing on the SNAC (Social Networks in Archival Context) project, will discuss issues of applying demographic terms in authority records, both their potential value and the issues raised for archival description. A group of cross-institutional archivists will report on their recent “Relationships Workshop,” at which invited participants (archivists, educators, and students) discussed issues surrounding the representation of relationships in archival description, including issues of directionality, temporality, and sensitivity, resulting in a forthcoming best-practices white paper. Speakers from Yale University will report on an ArchivesSpace reclamation project, sharing best practices for creation of agent and subject records, methods for reconciling existing nding aids and collection-level catalog records, and experiences in collaborating with vendors to enhance legacy data, including addition of linked open data URIs. At a time when citizen engagement in local, regional, and national politics is on the rise and activists across the political spectrum are asking questions about the accountability of local, regional, and national governments to the people, many archivists are wrestling anew with our responsibilities as political actors. What professional ethics and personal values inform, or should inform, our daily work? What form does political advocacy take in archival spaces? What political inequities are replicated in archival collections, spaces, and practices — and how do archivists acknowledge and challenge these patterns? What is the role of archivists in advocating for, and facilitating as, government employees, as well as advocating for government record-keeping, accountability, and transparency? Roundtable participants will discuss the sociopolitical urgency of archives work and suggest ways for archivists to engage in political action and debate. Business records play a vital role in documenting society. Yet their importance is not always recognized by the public or even by the very institutions that create these rich materials. Archivists who work with business records must often promote their worth to internal audiences, records creators, and even the community at large to prove how these critical and underused resources can provide value. Presenters will describe advocating for archives as a tool to drive business value and promote culture within an institution; efforts to protect the legacy of philanthropic foundations and nonprofits by raising awareness of archives and promoting good record-keeping practices; and the use of corporate records to inform a local documentary on urban renewal — and how a business repository can become a trusted community partner. rough their presentations, the speakers will examine the relationship between business archives and users, and the role of business records within society. Speakers will present on efforts to improve collection access for underrepresented communities and to highlight collections documenting those communities via enhanced description and digitization. Projects discussed will include Boston College’s re-processing and digitization of Jamaican folk tales recorded by schoolchildren from the Joseph J. Williams Ethnological Collection, and UMass Boston’s processing of the papers of Theresa-India Young, a practitioner of traditional African fiber arts and coil basketry, community organizer, and artist activist. We will also hear how Lawrence History Center’s outreach efforts, despite socioeconomic challenges and language barriers, are bolstering its immigrant community’s interest in and passion for their new city’s history.